I like Eco-friendly. I like creative. I like tshirts. Guess what? I like OMunky because they do a great job of combining all three. They have the fresh designs and they print them on American Apparel organic tees. There’s a lot to like in that potent, responsible combination. Plus, you gotta dig a the funky spelling of munky and the off-center head of the monkey logo. They did this thing right, and that first impression makes a big difference. For me if I see that they get the whole branding and website pitch perfect, I’m pretty comfortable making a purchase, knowing that when the package comes the t shirt is going to be comfortable and look good. 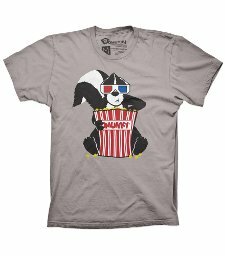 One of their newer offerings is the Skunk Cinema t shirt and it’s great. This dude is enjoying himself at the movies with a large bag of popcorn and 3D glasses. There isn’t anybody around him because they’re probably terrified of being sprayed, but what does he care. He’s there for the entertainment and snacking. Check out OMunky T Shirts now.